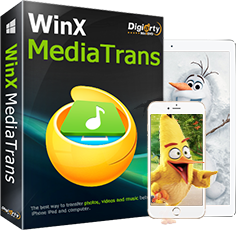 WinX MediaTrans More than iTunes alternative. Master your iPhone variously. * You get the latest Full Version activation info by email instantly. 1 Year / 1 PC Use this product for 1 year and renew if you're satisfied. Lifetime / 2 PCs Purchase for a one-time fee, enjoy Lifetime Free Upgrade. HD Video Converter – Download YouTube Video and Music. Convert any video to iPhone/iPad compatible format. 1 Year / 1 Mac Use this product for 1 year and renew if you're satisfied. Lifetime / 2 Macs Purchase for a one-time fee, enjoy Lifetime Free Upgrade. WinX MediaTrans offers the flexibility to quickly transfer all of your precious memories with ease - no iCloud or Wi-Fi necessary. WinX MediaTrans is just the kind of simple, streamlined, easy-to-use tool we've all been looking for, enabling you to transfer files in seconds without the pain. Remove trial limit and use all features. Manage iPhone iPad freely. Completely free update to enjoy any major or minor improvement. SSL & https secured, purchase processed by trusted e-platform. A dedicated iPhone manager that knows you the best. Worry-free money back guarantee in 30 days. Have problem on placing your order? We are here to help! Top-notch program to manage iOS file, transfer music, video, images, iBook, ringtone, etc., mount iDevice as USB. Download online video & music, convert any videos to any formats for playback on PC or transferring to iDevice. Ultimate DVD solution to rip any DVDs to mainstream video formats for playback on PC or iPhone iPad Android.